Rusty Wallace is aka. LEAD FOOT. He is the kind of driver that say's Never say Die! A real competitor in what has come to be the largest growing Motorsport in the World. The Sport in which we call NasCar the Winston Cup. Rusty Dominated at the spring Bristol race. Now it is time for the fall race ! Yes it is time to do it again. Rusty broke the track record at Bristol and at Watkins Glen. Rusty is considered one of the best at Short tracks and Road Courses. Rusty's favorite track is Bristol, He has got 6 wins and alot of top 10 finishes at Bristol. The same goes for alot of the other tracks. 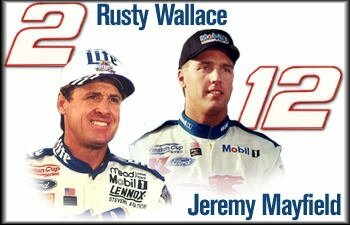 Rusty Wallace and the Penske Miller Lite Racing Team. "HAT'S OFF TO YA"
This is Rusty's new ride for the 1999 Season. Plus this is also the new paint scheme for the Texas 500 race. This Rusty Wallace's Race Hauler for the 1999 Season. Final Standing's for 1998 Season! RUSTY FINISHED 12th. IN THE POINT STANDINGS;JEREMY MAYFIELD FINISHED 10th. IN POINTS. THIS IS RUSTY'S RIDE FOR THE 1998 SEASON! 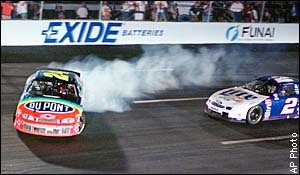 THIS IS RUSTY'S TEAMMATE JEREMY MAYFIELD!...GO PENSKE!!! HERE IS RUSTY AND MAYFIELD BATTLING IT OUT TOGETHER. 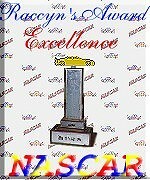 Another great site on info about Penske Racing. 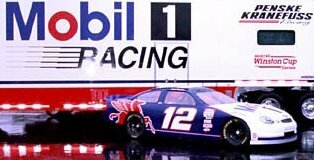 Who is going to be the 1999 Winston Cup Champion? Hear the drivers talk to their crew over the radio! Check it out!...See where your favorite driver is placed. Rusty is Laps ahead of the competition "Thanks to you"
This site was created by the Badger Outlaw for the Nascar Fan!